Roberto Mancini has tried to diffuse his training ground bust-up with Mario Balotelli on Thursday and suggested that the controversial striker still has a future at Manchester City. The Sweeper understands, however, that Balotelli’s mind has long been made up that he would like to leave the Etihad Stadium in January as Italian giants AC Milan prepare a bid. 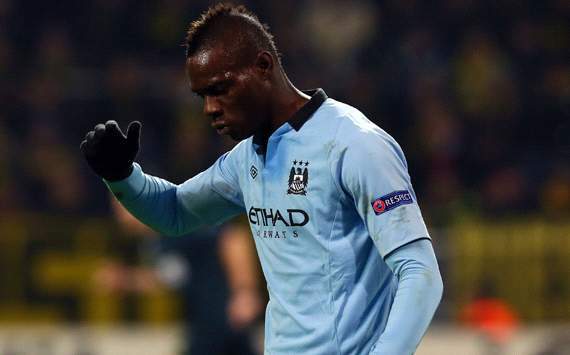 Mancini may have said that he will give Balotelli ‘100 more chances’ if necessary, but the 22-year-old is homesick and wants to return to Italy to be with his girlfriend and newborn child. The one thing keeping him at City may have been his close relationship with Mancini, but the pair have increasingly been at loggerheads, culminating in the embarrassing public spat this week that was captured by photographers on the footpath by the club’s Carrington training base. Milan have made Balotelli their top priority for the winter window and the player has never hidden his desire to play for Rossoneri, where he would be willing to take a small wage cut on his current £110,000-a-week salary. A loan move is more likely for Balotelli, but both the former Inter man simply want his time in England to end as soon as possible as his relationship with the club continues to rapidly deteriorate. He has scored just one Premier League goal this season and fell out with City chiefs last month after taking them to a tribunal over a two-week fine for breaching club discipline rules, which he later retracted on December 19. Mancini has constantly defended Balotelli’s behaviour but even the City boss has started to openly criticise the youngster’s attitude, claiming he must work harder in training to fulfill his potential before the sensational scenes this week on the training pitch. Rob Green has made no attempt to hide his dis-satisfaction at joining QPR to be the No.1 keeper only for Brazil star Julio Cesar to demote him down the pecking order. The Sweeper understands that the England international is ready to leave the Premier League strugglers after losing his starting spot for the second time this season. Green is furious at being axed from the team following the club’s 2-1 Boxing Day defeat to West Brom, in which he was credited with an own goal. Fit-again Cesar is set for an extended run in the side after helping keep Chelsea at bay in the shock 1-0 win at Stamford Bridge in midweek. Green, 32, has stopped short of handing in a formal written transfer request but wants to find a new club before the end of the window. His £40,000-a-week salary will be beyond many suitors but Everton and Southampton are among the clubs who could provide a new home for the former West Ham man. The Premier League will enter into a new official beer partnership three years after its £2.25 million-a-year deal with Budweiser expired. The world’s richest league has been in market consultation on the title sponsorship with a number of interested brands for what is expected to be a three-year term. The Sweeper has learned that Carlsberg are the frontrunners to secure the agreement, with Budweiser, Heineken and Diageo also in the running. Insiders say the new deal could be worth four times that of the £6.8m three-year agreement with Budweiser that expired in 2010. The American firm had been the official beer of the Premier League from 2002 to 2010.